>Currently, you are in front of the Myouren Temple. You had hoped stepping outside would change things, but no. You still feel it. Kyouko is currently sweeping up the front path, and you can see that Shou is trying to adjust one of the new buddha statues that has come in. There’s no one but temple residents around, which is normal for mid morning. To the south and east lies the whole of human town, bustling away. Though in the immediate area, it is rather quiet, the only person you can see is a middle-aged woman gathering water from the well outside the temple gates. To the north are fields and farms, and a lone road leading outward. Obvious Exits are South, East, West, and North. > Have we ever had the willies like this before? If so, what were they about? >You died a young woman, hundreds of years ago. As such, dead most of your life. >You can sail like a pro. Not that you get much chance to use this. You were even a dab hand at the the flying arc! Before Hijiri grounded it to make the Myouren Temple. >You may not be the best buddhist in the world, but you do have a fairly good understanding of buddhist scriptures and practices, and in particular how they entwine with local beliefs. >You can chant sutras a pretty well. They never seem to do much for you, but it can be terrible calming. >You are very proficient at first aid due to your work with the Underground clinic. Also you know a lot of hangover cures. >You are a very very accomplished whittler. You've made a variety of model ships! >You've learned to be very good at it. >Fit for a captain, thus fit for you. >It completes your outfit. You have shorts that look a lot like them, too. >These have a bit of a ship's deck cobbled into the soles, so you can be more comfortable on land. >This dipper has no bottom. When you just can't resist the urge to flood a ship, this is will buy some time. >It's not that heavy; they stop ships by grabbing onto the bottom. If they did it by weight, they'd sink the ship! >Toss an anchor, leave a trail of water. >Harbor Sign "Phantom Ship Harbor"
>You embrace your ghostly aspect with this survival card. >You are well acquainted and on good terms with every member of the Myouren Temple. Hijiri is someone you respect deeply. Shou is someone you should respect deeply, but she is just too relaxed, and is a good friend. Ichirin is something of a partner in crime, so to speak, both of you are first lines of defense for the temple. Nue is a barrel of laughs. Kyouko is so earnest you feel the need to try to be a good example for her. Mamizou is...shifty. Up to something. But she's your shifty and up to something. >Tojiko is...well, she's a pain. Sharp-tongued, and always on her master's side. You can't blame her, though, she usually doesn't start trouble, compared to the others. But there are times when you'd really like to whack her with an anchor. And there are times when maybe she's alright. >Not like this, no. You've had your share of worries, willies, and jibblies, and this is new. > We don't feel any particular sort of ghost kinship with Tojiko at all, do we? > What's Morichika been up to these days? > Are we particularly familiar with anyone outside of the village, excepting Toyosatomimi and her entourage? >Nazrin is a good person, if a bit too cynical for her own good. You used to be that way. >You've never really thought about it like that. Huh. >He has been doing pretty well. There's been talk of him and Nazrin working together in Kourindou. >You're pretty familiar with a lot of people. You get on well with Eientei; you hid there some years ago when late fall felt like the worst of summer. You've visited the Scarlet Devil Mansion plenty of times when they have public events. You're on speaking terms with the people at the Palace of the Earth Spirits. Sometimes you drop in on those outsider kids. and in general, you are decently known around the village. Just for everyone's information, I will be camping this holiday weekend and will have extremely limited access from Friday night to Monday mid-day. As such, I am intentionally not doing a whole lot to begin here, because I don't want to set this game on a meaningful path and then immediately disappear while everyone assumes I've taken the game over. If you ever wanted to get multiple days in a row with one of these without me around to muck everything up, now's your opportunity! > Is our ghostly status and Tojiko's ghostly status something worth trying to bond with her over, even in the most minimal of senses? Or is it no more than a coincidence, where neither of us is suddenly equipped to make the other's existence better? > How has the Temple taken to that sworn statement thing the mansion maid brought? > Did we ever find out why our name wasn't on it? > How's that jeweler kid doing? > What do we have that's special specifically due to being a ghost? Can we walk through walls? Disappear? Fly? > How limited are we in the aforementioned? > Compare our self to other types of ghosts. >You never really thought about it, to be honest. Maybe...you could? >Frankly, you think it's a fake. But, the sentiment isn't a bad one? Hijiri seemed to be touched with it, at least. Honestly, the Taoists haven't been that much of a problem lately, maybe that's why you're even thinking about that darned zap ghost like this? >Clearly because no forged signature of yours would be believable! >She's fine, as far as you know. You don't go shopping for jewelry, not even you are that bad at being a monk! But you see her skulking about sometimes. >You can't walk through walls, but you can kind of disappear. And you know how to fly. >You're a fair flyer. As far as disappearing, you can go kind of translucent, and not exactly intangible. It's like you're made of foggy goo. It's not fun to do, honestly. >You can't speak for every kind of ghost, but you are unique in that left to your own designs, before Hijiri found you, you would roam the seas, looking for ships to sink. This is because you died in a shipwreck, which you do not like to think about. You kind of have an obsession with making things vanish under the water; you don't tell the others, but when you take baths, you like to bring in model ships and sink them. If you met someone drowning...you might have to fight the urge to just watch rather than help them... You don't like thinking about that situation. >Presumably being a good sailor means we're also good at tying knots? >You tie some very fine knots! >No. You can go under water just fine. Sometimes, though, staying there too long puts you in a melancholy mood, so you don't tend to do it a lot. >Relatedly, how's our sense of direction? >You haven't actually used navigation tools; you sailed mostly around the coasts. But, you're very skilled as using the stars to navigate. >You always know which way is north. > Of the people we know, who would we consider talking of this feeling with? Even just a little. >Something feels wrong, you don't know what. But it's setting your teeth on edge. > Chat up with Shou. Greet her briefly and hope she's not too busy for at least that. > Add Quest: Kindred Spirits, about pursuing the possibility of an improved acquaintanceship with Soga no Tojiko. We don't need to be besties, or lovers, or anything like that! That'd be weird! But it would be nice to have someone we can go to and commiserate with about ghostly matters. > Opinion of the Prismriver Sisters, Youmu, and Yuyuko, if we know of them. 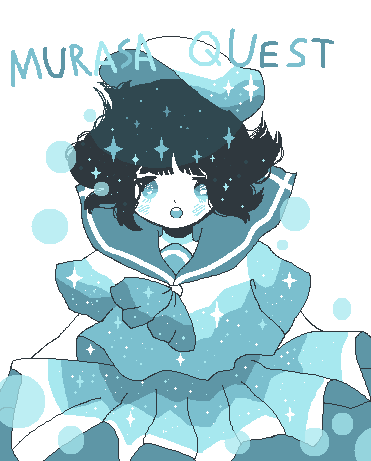 >"Hello, Murasa!" she says, as she shifts the statue. She then steps back and purses her lips. "Hm, no... maybe a little further left... What're you up to, today?" >You know what? You're going to do your best to try and make friends with one of those lousy Taoists! You are going to make Hijiri proud! >The Prismrivers are kind of flightly, but they're good musicians. >Youmu is a pretty earnest person, but you don't see her much. >You've seen Yuyuko when she put on a play awhile back. She seems...troublesome, but not necessarily bad. > "Nothing just yet. Have you had any sort of, well, tickle, lately?" >"Don't tickle me when I'm trying to adjust this statue!" she says, giving you a startled look as she pauses from reaching toward it. > "Ah, no I wasn't proposing such. Just wondering if you felt anything weird." >"Oh, sorry, you look like so much like Nue," she says with a wink. >"No, I can't say I've felt anything particularly strange." > Does the feeling feel any stronger now that we're near Shou? >There is no change in the feeling. >Looking over the statue, you honestly think Shou is being fussy. But, maybe an half inch to the left would be good? >What would happen if we were to take physical damage? Can we be wounded? >"Yarr, blow me down I've been feeling like I've lost my sea legs lately." >"Today I've had this weird feeling that I just can't shake. It feels like something's.... wrong. But I don't know how or why." >What part of the world do we originate from? >You can be hurt, you are rooted enough in the world for that. >Don't make me shiver those timbers, hun," Shou says sweetly, then cracks her knuckles. >"Are you okay?" Shou says, looking away from the statue and frowning a little. "You're not just coming down with a case of the blues, are you?" >Shou puts a hand on your shoulder. >You come from the Akita region. >Try to adopt a less serious manner. >"I'm sure it's nothing important. Maybe Byakuren has some idea what's going on." >Shou gives your shoulder a friendly squeeze. "She might. Maybe you've just been cooped up around the shrine too long?" >Are we prone to feeling down?